Alex Kurpil, Senior welding student, was honored as the first MAC Trailer student of the month on Friday. MAC Trailer has partnered with Alliance High School to spotlight an outstanding student in the welding program each month. 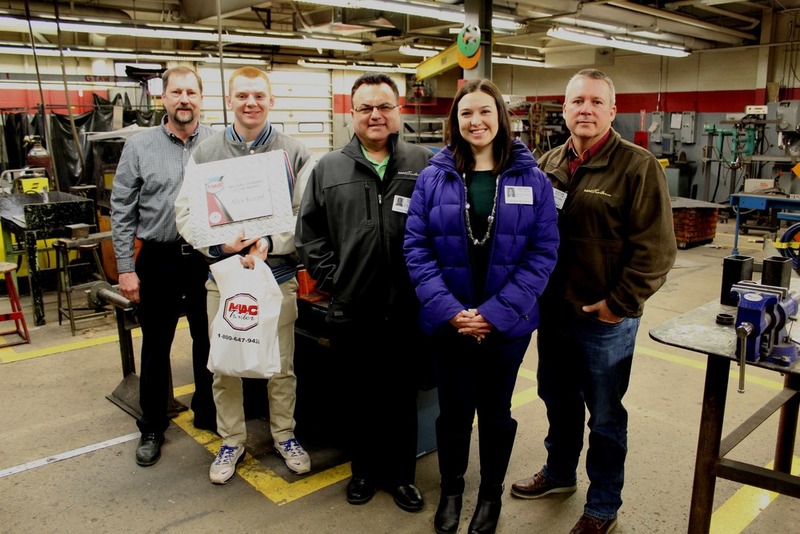 Dennis Postiy, Corporate Vice President, Gary Conny, Manager of Corporate Training and Development at MAC Trailer and Sienna Oswalt, Recruiting Coordinator at MAC Trailer made a visit to the High School Friday to present a plaque and gifts to Kurpil in front of other welding students. “We want to encourage great work effort like you have done, Alex, and hopefully you all aspire to earn this,” Conny said. He added that the notion that there are few jobs in Alliance is not true. “As long as you work hard, show up every day, stay off drugs and work you are going to have a job you can have the rest of your career and that’s what we want to encourage,” Conny said. At the end of the year MAC Trailer plans to have a banquet for all students who have earned the Student of the Month honor. AHS is the only high school partnered with MAC Trailer at this time. Kurpil is a member of the Army Reserves and plans to attend Kent State University in the fall. He is considering studying industrial management, under the advice of Conny, which he can use in the welding industry at places like MAC Trailer. Kurpil humbly accepted the plaque as well as an Amazon Gift Card and MAC Trailer t-shirt, hat and pens as a reward for Student of the Month. “The support of my family and friends helps me a lot. My family and friends and teachers are the reason I do everything I do. I want to make them look good,” he said. 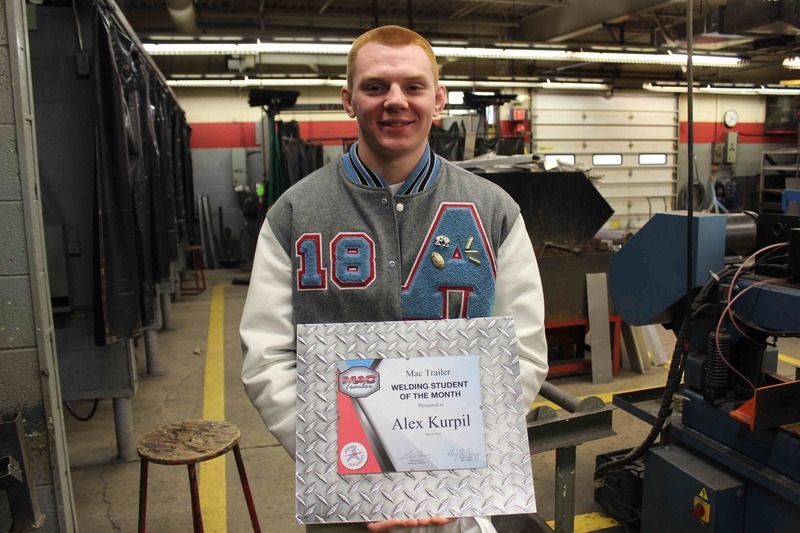 Steve Fuson, Welding Instructor in the High School Career Tech program, said he nominated Kurpil for Student of the Month because of his reliability, retention skills and follow through with commitment. “He has served as Foreman in my senior class and there’s a lot of little things like his attitude. He comes in everyday, shakes my hand and says ‘How you doin’ Mr. Fuson?” he said. Students in Fuson’s class had the opportunity to apply for work at MAC Trailer while they are in school. Kurpil was hired for a position and worked three days before dislocating his arm in a school wrestling match. After recovery he plans to go back to work at the plant. The partnership with MAC Trailer is part of the business’ and district’s efforts to keep skilled workers in the Greater Alliance area and provide high-paying jobs to AHS graduates. Gary Conny, Manager of Corporate Training and Development at MAC Trailer awards Alex Kurpil with a student of the month certificate for his exceptional work as a welding student.